Lee Mowle, Yelmer Buurman, ERC Sport and Mercedes-AMG came through from last to claim their maiden outright British GT victories and take the championship lead at Rockingham earlier today following a frenetic two-hour enduro. Meanwhile, Patrik Matthiesen and Callum Pointon executed a flawless race en route to a dominant GT4 victory for HHC Motorsport and Ginetta. Four Safety Car periods and a slew of penalties helped ERC Sport’s Lee Mowle and Yelmer Buurman emerge victorious from a typically action-packed British GT encounter. The pair were joined on the podium by TF Sport’s Derek Johnston and Marco Sorensen – who were subsequently penalised 30s post-race – as well as Team Parker Racing’s Ian Loggie and Callum Macleod, although any number of crews could and probably should have featured on the rostrum. Barwell Motorsport’s Jon Minshaw led the field away from pole but twice saw sizeable leads wiped out by Safety Car periods. Optimum’s Flick Haigh gave chase initially before losing out to Sam De Haan before the first Safety Car period, which was triggered by Shaun Balfe’s McLaren hitting the Turn 12 wall. Haigh’s excursion at Tarzan just after the restart promoted Graham Davidson – flying in the Jetstream Aston Martin that started ninth – to third behind De Haan. The pair remained in that order until after the second caution period, required while David Pattison’s beached Tolman McLaren was retrieved, when Davidson dived down the inside at Deene. The Scot then went after Minshaw who, having established a 10s lead before the second Safety Car, was unable to replicate that same pace thereafter. And although the Aston Martin was unable to find a way past, it was perfectly placed to inherit the lead during the pitstops when the #33 Lamborghini served its additional 20s success penalty for winning at Oulton Park. Davidson’s co-driver Maxime Martin duly re-joined 15s ahead of Phil Keen, an advantage that was swiftly wiped out by the day’s third and fourth Safety Car periods in quick succession. But when the race went green for the final time Jetstream’s V12 Vantage was pinged for multiple track limits violations and had to serve a drive-through penalty. That should have handed Barwell’s #33 Lamborghini the lead. However, just before Martin pitted, Keen was passed by Buurman whose co-driver Mowle had kept the AMG in contention throughout the opening stint while rivals faltered. Indeed, the Mercedes found itself seventh at half-distance after an electrical glitch stymied Mark Farmer’s Aston Martin, Derek Johnston received a drive-through penalty for contact, and Rick Parfitt Jnr was spun around. Buurman maintained the charge thereafter and was perfectly placed to benefit after also passing Darren Turner. But while the race had come to ERC Sport, it was getting away from Barwell whose challenge faltered at the pitstops. First, De Haan’s Huracan – due to inherit second place – was retired with a clutch problem before co-driver Jonny Cocker had a chance to re-join. The pitstops also put paid to #33’s second place when Race Control handed Minshaw and Keen a subsequent 10s stop/go penalty for an infringement. That gave Buurman a reasonably straightforward run to the chequered flag, which he took 4.3s clear of TF Sport’s Sorensen. However, the Aston Martin – which had already been handed a drive-through penalty for contact – ultimately had another 30s added to its race time as a direct result of spinning Parfitt Jnr out of fifth midway through the opening stint. Team Parker Racing’s Ian Loggie and Callum Macleod therefore moved up one place to second in the final standings after the latter finally overhauled Beechdean AMR’s Darren Turner on the penultimate lap. Turner and Andrew Howard were third ahead of Haigh and Optimum co-driver Jonny Adam, who was also in hot pursuit of the podium places during the second stint. Martin and Davidson recovered from their drive-through penalty to finish sixth on the road but fifth in the final result, while the latter’s charge from ninth to second earned him Blancpain’s Driver of the Day Award. Keen was just 0.2s behind at the finish and close enough to salvage sixth for Barwell after a tough raceday at Rockingham. Johnston and Sorensen slotted into seventh, finishing ahead of Ryan Ratcliffe and Parfitt Jnr’s delayed Bentley which completed the classified GT3 entries. 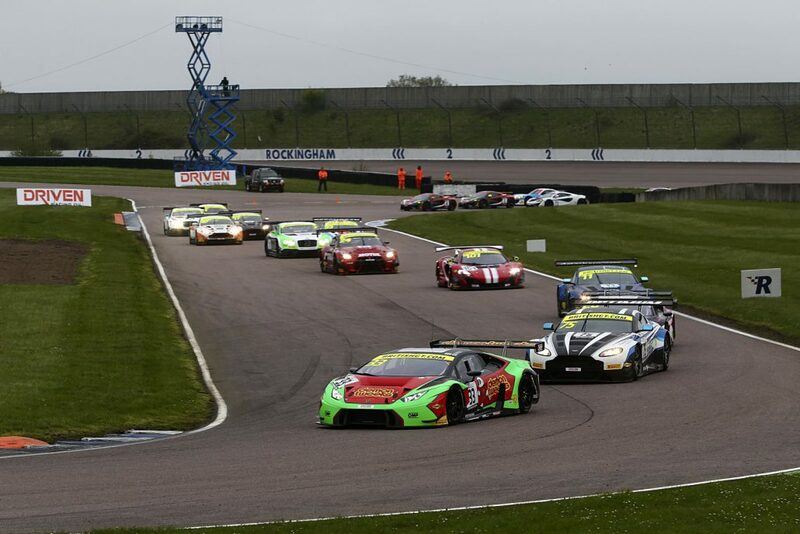 HHC Motorsport’s Patrik Matthiesen and Callum Pointon claimed their maiden British GT4 victories at Rockingham, while UltraTek Racing Team RJN’s Stephen Johansen and Jesse Anttila were the first Pro/Am pairing home in second overall. Academy Motorsport’s Matt Nicoll-Jones and Will Moore completed the podium. It was at the same venue 12 months ago that HHC broke their GT4 duck en route to both the Teams’ and Drivers’ titles, and the squad employed similar tactics to get the job done once again. A demon start helped Matthiesen climb two places to second in the opening laps before hassling pole-sitter and race leader Charlie Fagg. Ben Green’s BMW made it a three-way scrap for the lead initially before an off at Deene dropped the M4 seventh. That left the top-two and Equipe Verschuur’s rapidly advancing McLaren driven by Dan McKay nose-to-tail out front, the Ginetta closing right up and even alongside through the twisty infield before losing out to both 570Ss down the long straights. Lap after lap they circulated together before Matthiesen used the GT3 traffic to finally find a way past Fagg, who also lost out to McKay in the same move just before the pit window opened after 60 minutes. But while both Equipe Verschuur and Tolman pitted their McLarens, HHC elected to wait another 10 minutes – just as they did 12 months ago – before calling in their #55 Ginetta. And with the extra 20s minimum pitstop time for all Silver Cup crews negated, Pointon re-joined the action still leading from Michael O’Brien, who’d taken over from Fagg. But while the Ginetta was able to extend its lead and ultimately cruise to victory by 23s, O’Brien began slipping back into the clutches of his pursuers. Track-Club’s stop/go penalty for a short pitstop provided some relief initially, but there was no stopping Anttila who, as one half of UltraTek’s Pro/Am crew that also featured Johansen, had benefitted from the shorter minimum pitstop time. 11th before the pit window thus became fifth afterwards, before the Finn also passed Finlay Hutchison’s Verschuur McLaren, Ben Barnicoat’s penalised 570S and, ultimately, O’Brien. Attention now switched to the final podium place, which featured a late four-way battle that eventually went Nicoll-Jones’ way. Academy’s #62 Aston Martin was running fourth before the stops in Moore’s hands but dropped to seventh when it re-joined as a result of the Silver Cup’s extra pitstop time. Nicoll-Jones wasn’t deterred, though, and carved his way back through the field late on to claim the final place on the podium. UltraTek backed up its best-ever British GT4 result by also taking fourth overall and a Pro/Am one-two courtesy of Kelvin Fletcher and Martin Plowman, who both produced standout performances in their respective stints. Indeed, the latter made the decisive move on O’Brien on the final lap. Equipe Verschuur finished sixth after spending all afternoon fighting at the front, while Century’s Ben Tuck and Ben Green battled back from their earlier issue to finish seventh. Tolman’s second Silver Cup McLaren of Lewis Proctor and Jordan Albert, plus Academy’s Tom Wood/Jan Jonck and Balfe Motorsport’s Graham Johnson/Mike Robinson completed the points paying positions. Elsewhere, Team HARD. with Trade Price Cars won the PMW Expo Team of the Weekend Award for repairing their heavily damaged #88 Ginetta between practice and qualifying on Saturday, as well as persevering with issues throughout the race. Meanwhile, lap records fell in both classes courtesy of Sorensen (1m17.769s) and Matthiesen (1m23.642s), who were awarded Sunoco Fastest Driver of the Weekend trophies on the podium. Next up it’s Snetterton where British GT returns to its 2x 60-minute race format on May 26/27.